Why are Shotcrete Home highly insulated Concrete homes 300% more energy efficient than wood-frame homes? The answer is simple. 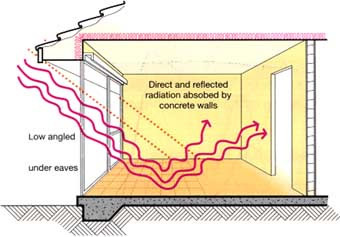 The mass of a Shotcrete Home Concrete wall slows down the passage of heat transfer. The properties of Shotcrete Home’s thermal mass means a warmer home in winter and a cooler home in summer. A Shotcrete home eliminates Air-leakage, which contributes towards a large percentage of energy loss in most homes. A Shotcrete Home building utilizes cost effective and efficient insulation to keep your home dry, air-tight and comfortable all year round while you and your family enjoy the benefits of lower energy bills. The Shotcrete Home Wall uses EPS Polystyrene providing insulation and a formwork to which reinforcing steel and concrete is placed against. These polystyrene forms are left in place to ensure superior R-value. The insulation does not have gaps like insulation that is fitted between studs; instead, the Shotcrete Home Insulation is continuous along every wall and around every corner. A thermal bridge is a material which forms part of a wall where heat can escape from and cold can penetrate through. Theses materials such as timber, steel and concrete are not insulators and contribute to thermal bridging, greatly reducing the energy efficiency of the home. Concrete with its thermal mass properties needs insulation. Steel is a conductor, the opposite of an insulator. 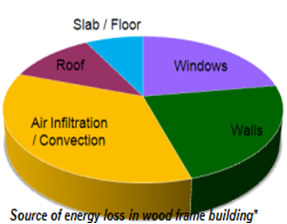 Timber is not an insulator. The average timber frame wall is 25% Timber and 75% insulation. If the insulation is R2.6, the timber R0.8, the True R-value of the entire wall is only R-2. A Shotcrete Home concrete home is built with solid concrete walls, they are more air-tight than stick framed homes. The continuous layer of rigid insulation used in concrete construction provides a continuous thermal barrier, unlike a stick framed wall, which is a collection of components including studs, linings, sheathing and insulation which is non-continuous. Each joint and connection is not only a weak link but a potential air leak. This reduces drafts and cold spots inside your home ensuring comfortable living spaces. 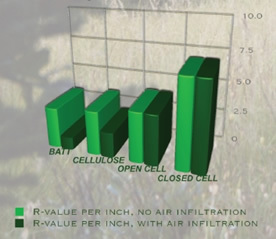 When fiberglass batts or cellulose products are subjected to wind penetration (known as air infiltration) in a wall cavity, the “True” R-Value is reduced significantly as shown in the chart shown. Our polystyrene is made with the most environmentally friendly components available today. It is long-lasting and will not shrink or settle, maintaining a constant R-Value and air barrier. This inhibits growth of mold and mildew by eliminating the critical components of mold growth – air and moisture. Shotcrete Home Concrete has heat-absorbing properties called Thermal Mass. Thermal Mass regulates extreme swings in temperature over time. It prevents the house from overheating or sudden temperature drops when the heater or air-conditioner cycles go on and off throughout the day. Cool in the summer and warm in the winter for year-round comfort. 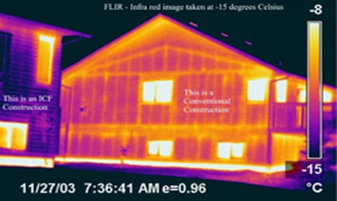 For thermal mass (Heavy concrete) to be effective, it must on the inside of the insulation. If the thermal mass is not insulated from the outside cold it is not effective and can become more a problem than a benefit, this is why it is vital that there is no thermal bridging (breaks) in the insulated wall. Shotcrete Home walls and floors are continuously insulated with no thermal bridging. Thermal mass is best located where it receives direct sunlight (Radiant Heat), this is generally the floor and strategically placed concrete walls. 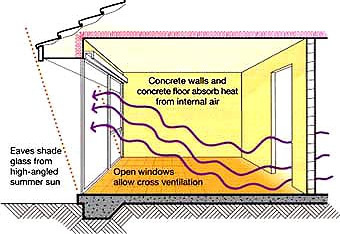 Thermal mass floors and walls are also placed best in rooms where there is excessive convectional (air) heat gain. In summer energy from direct sun and from warm circulating air is absorbed by the cooler concrete mass, thus reducing the air temperature within the home. As the air temperature decreases in the evening, stored energy within the concrete mass re-radiates ~ providing consistent, comfortable temperatures within the home. This cooling effect of thermal mass is especially beneficial in very warm climates. Capturing the free energy of the sun is relatively simple with a concrete home. Energy from direct sun and from warm circulating air inside the house is absorbed by concrete mass, and the house temperature including the thermal mass regulates to the same temperature. As the outside winter air starts to cool and chill the warm concrete mass releases the stored heat thus keeping the temperature of the home at a high level, relative to the temperature drop off outside. The concrete mass radiates heat providing consistently comfortable temperatures and reducing the requirement for primary heat sources such as fires, heaters or Air-conditioning units within the home.